Also known as the Palace of Westminster, the Houses of Parliament were once the official residence of the English Royal family. The oldest part of the building, Westminster Hall, was completed in 1097 and has played an important part in British history ever since. The majority of the original palace was destroyed by fire in 1834. The current building, designed by Sir Charles Barry, was completed in 1870. 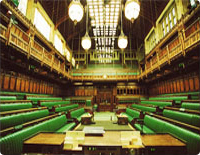 Are you interested in visiting Parliament , to watch a debate, or to see a select committee?